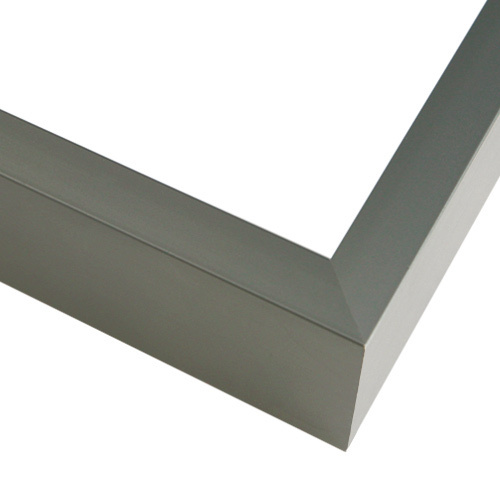 The subtle finish of this graphite metal picture frame adds style to a bold, square shape for photos, posters or drawings, creating a stunning presentation for your masterpieces! It also features a crosshatched surface, adding to the contemporary feel. Customize your size up to 1/8th of an inch! Great for any room in your home or office. Quality + value. Your art. Your way. Ships lightning fast. 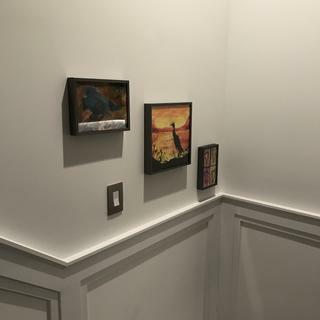 I requested various samples for the painting to be framed and found this one to match well and make the painting stand out, while not overshadowing it. Highly recommend. We're glad you were able to put our sample send to good use! It's so important to us to be able to offer those samples so you DO have the opportunity to create the most perfect presentation possible. Thanks for sharing the finished product! An excellent frame. My only complaint was that the corners didn't fit together perfectly. They did in the front, where it most matters, so I would still recommend this frame. Thank you for your review. We certainly want all the corners to join properly on the frame. If you would like us to replace the frame, please give us a call at 1-800-332-8884. 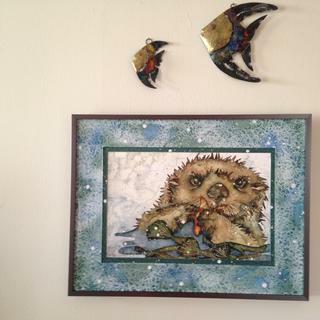 We would simply need you to email us a photo of the frame's corners and then we will gladly replace the frame. Thank you for your business! We loved the frame - it was easy to put together. The frame is very simple/elegant but not achingly contemporary. It fits our modern but comfortable house perfectly. 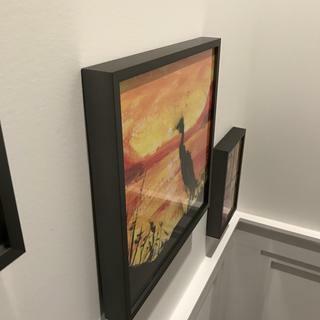 So glad about this site that we can order the exact dimensions of our frame. I ordered metal frame for our travel map and it arrived quickly and it was perfect. I wish however the company will also offer some sort of corner caps to the assembled frames as the metal frame corners are very sharp. I gave a 4-star because the shipping is expensive in my opinion. I purchased the HS15 Graphite Frame due to lack of any similar color and sized wood frames on your site. I did this, knowing from past experience with these types of frames, that it is frustratingly impossible to assemble them and obtain a perfectly matched miter joint across the front and depth of the corners. The last SP2 wood frames I purchased from your organization had the remnants of black seam filler that I had to remove from the corners. I have personally used this type of filler on my own shop-built frames in the past, and know it produces a fine finished frame. I have never heard of such a product for metal frames, but if it exists, it should be supplied in a matching color with any metal frame order. The printed assembly instructions provided would not allow the unexperienced neophyte to assemble the frame without gaps at each corner. They should contain a line that explains each corner must be tightened, loosened, and retightened in rotational sequence to even come close to achieving a tight miter joint. Not being a fan of acrylic, I chose that option because it was the only way I could see to order a sized piece of foam core backing. If there is such an option, I couldn’t find it on your site. The acrylic I received required several smudges to be buffed out after the inner lining was removed, and as a result, created numerous statically attracted particles which then had to be removed – another reason why I do not like acrylic. I always prefer archival glass when framing my photographs, which is not an available option on your site. This is the reason why I have only ordered wood frames in the past. I have to buy the glass and foam core locally. This order also came with four small white pieces of self-adhesive foam attached to each other. I assume they are to be attached to the back in each corner, although the assembly instructions didn’t mention them at all. Thank your for your detailed review. I understand that the metal frames take a bit of patience to assemble perfectly, we are currently reviewing our hardware instructions and will make a note of your noticing. At this time I have not heard of finishing material for metal frames either. It sound like you ended up ordering acrylic when all you wanted was a sheet of foam board. In the future we can take specialty orders over the phone if you wish to purchase individual components. We wouldn't want you to order something you weren't satisfied with. I am sorry to hear that your particular piece came damaged, we are always happy to replace any components with damage. Please let us know if there is anything else we can do for you. Our phone number is 1-800-332-8884. I chose this frame for an architectural illustration for a client and it turned out better than I thought. Sharp and stylish. Couldn't be happier. I have used all of these frames before and know they will look good. I chose each one to go with the picture I am framing. Whenever possible I get samples to help in my selection. I will only write this once as it is the same answer for all the frames I ordered. Will look good with my black and white art without overpowering the art itself. On the product page, there is a section that says "Can't Decide? Frame and Mat Samples Available." select that and you will be given sample options. Select the sample you are interested in and add it to your cart and checkout. If you have additional questions do not hesitate to contact our friendly framing experts at 1-800-332-8884 Monday - Friday. I don’t know. But it’s a frame we loved in our modern house. 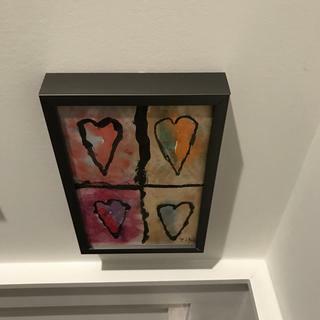 We used it to frame our sons paintings and the frame looks great. I would go ahead and order - I think you’ll love it and even in a super traditional house it’s pretty inoffensive. I didn’t request samples. I ordered a graphite frame. It was chipped on one edge so I returned it. I decided to go with a wood frame instead. Curious if this will come with a glass front to it? Want to get a 60 x 60 to fit the county map I have in my store. BEST ANSWER: Hello Dayton. At this time, our frames do not include glass. We use a plexi-glass material called acrylic instead of glass. Our Customer's framing canvas do not need acrylic therefore, we do not include acrylic with every order. Unfortunately, our maximum size acrylic is a 48"x 96" which will not work with your 60"x60" artwork. Thank you for your inquiry!